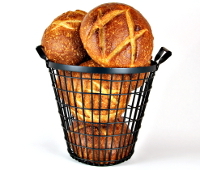 Sourdough Bread Bowls (6) #850 Scoop them out and add your favorite soup. From Debi Terrizzi of Bellmore, New York on 5/5/2018 . From Jerry Berlin of MONROE, Connecticut on 4/7/2018 . From Kathy Powell-Shelhorse of Roanoke, Virginia on 4/1/2018 . From John Sartori of Sequim, Washington on 3/2/2018 . Surprise thank you gift was the best! From Anonymous of S San Francisco, California on 3/2/2018 . From peter izzo of stratford, Connecticut on 2/23/2018 . From AMarlin of Houston, Texas on 2/15/2018 . From VIDAL CANTU of LAREDO, Texas on 2/15/2018 . THE BEST BREAD EVER !! From Deborah Tucker of Aurora, Colorado on 2/2/2018 . From Kathleen Martin of Puyallup, Washington on 1/19/2018 . From Katie of Los Angeles, California on 12/23/2017 . From Virginia Shakal of Greenwood, Indiana on 12/23/2017 . From Morris Johnson of Valentine, Nebraska on 12/3/2017 . From Stephen Griffin of Nacogdoches, Texas on 12/3/2017 . From Mark Christensen of Eau Claire, Wisconsin on 12/2/2017 . From James Dobrzechowski of Grosse pointe farms, Michigan on 12/2/2017 . From Jill of Caldwell, Idaho on 11/10/2017 . From Carole Doddroe of Payson, Arizona on 11/10/2017 . From Jane Owen of PORT NECHES, Texas on 9/29/2017 . 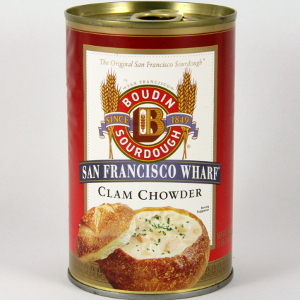 The original chowder used in our sourdough bread bowls. Just heat and serve for an excellent meal. It all started when we first combined our classic San Francisco Wharf Clam Chowder with our fresh-baked sourdough bread bowl. 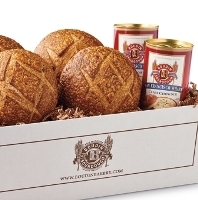 Our Classic Clam Chowder gift includes four sourdough bread bowls and two 19 oz. cans of our famous chowder.